Nomos is the novelty Ludwig Oberlehrer.Watchmaker Nomos is known in the watch market as a producer of original elegant models. Watchmaker Nomos is known in the watch market as a producer of original elegant models. This refined model, characterized by minimalist design, simplicity and reliability. Today the company announces the release of his new Ludwig Oberlehrer, which is presented in a circular enclosure with a diameter of 35 mm and 6.25 mm thick stainless steel. Black dial features Roman numerals, the two central arrows to indicate the hours and minutes. In “6:00” is a small window with a second hand. It protects the dial sapphire crystal. The back of the new items are also protected by sapphire glass, through which you can observe the work of the manufacturing machinery Alpha with manual winding and functions: hours, minutes, seconds. Ludwig Oberlehrer model comes in black leather strap with a buckle made of stainless steel. Water Resistant – 30 meters. New limited edition – 100 copies. 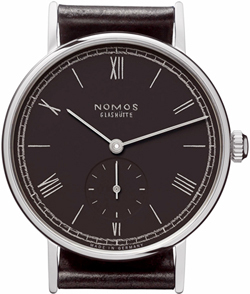 Buy watches from Nomos Ludwig Oberlehrer possible for Euro 1040.